MGF (mechano growth factor) has been used by bodybuilders and athletes for a few years already. 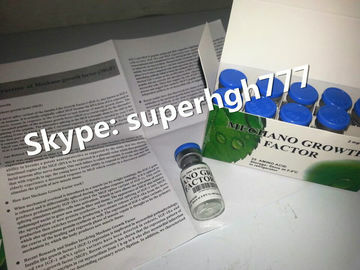 After resistance exercise, IGF-1 is released within the muscle. Specifically, at this time, immediately following the mechanical use of a muscle, the IGF-I gene is spliced towards MGF which initiates hypertrophy and repair of local muscle damage. It does so both by activating muscle stem cells and satellite cells, but also via various other anabolic processes. (1) It differs from “regular” IGF-1 mainly due to it’s C-Terminal sequence.